Servers | KGS | Roln111 Crushes Zchen! 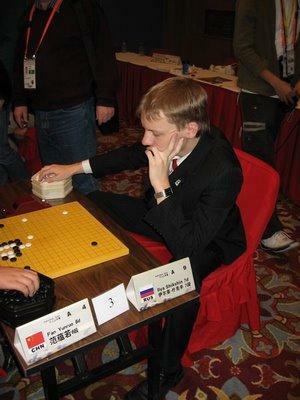 roln111 (Ilya Shikshin) and zchen (Zhaonian Chen) are both very well known players on KGS. Today they clash in an intense fight from beginning to end. The overall record since December 23, 2008 is 8-5 in favor of roln111, with roln111 having a 5 game winning streak. In this game, the action begins immediately with zchen deciding upon playing the taisha in response to roln111's 3-space low pincer in the lower left. The first major move of note was White 16, I have never seen it before with the C9 pincer, the usual continuations are at F3, C2, and E2. In the normal taisha joseki, this is regarded as a bit of a trick play. When Black blocks down with F3, I cannot see how the result would favor White since the ladder is favorable for Black. However, Black 19 is again a surprise. I believe that Black should play in the variation shown. Instead, in the game, Black allows White to create a formidable thickness. With the variation up to W 32, Black's territory is not that big and White's influence is very commanding, thus the result is great for White. Black 33 immediately tries to reduce the influence of White's wall, but perhaps this is playing too cautiously, a move in the upper area seems to be much bigger and indirectly limits White's influence. Next Black plays a relatively new "joseki" with 41, and the result is one I have never seen before, very interesting. White emerges with sente, cuts off K17, and is able to play C16. This allows White to make a really deep moyo on the left side. Perhaps zchen should have chosen a looser, high pincer? He elects to pull out with H5 at this point in order to attack White. However, White cleverly sacrifices the stones to obtain sente and enclose the center with tengen. Black invades desperately with 73, but the invasion dies, though he is able to reduce the moyo a bit from the outside. With 97, Black creates his own moyo daring White to enter, which he does promptly with 98. In the resulting sequence, Black forces a ko and in an exchange White is able to make his bottom group alive once again through 134. Black desperately tries to reduce White's moyo and attack White's group in order to maximize his own territory, but it is in vain as White continously eats into his territory on the right and completely solidifies his own moyo. Black resigns after White 208. Variation you showed is right. It's the best punishment of White's hamete C6.